As you drive up to your destination, the robotic parking system silently and invisibly analyzes you and your car. Before you get out, it identifies you as likely male and likely under 35. A hidden door in a nearby kiosk opens and out comes your personal robotic parking system robot…an attractive female android valet. “She” takes your keys, delivers a receipt to your smartphone and drives off in your car. Wouldn’t that be an experience? Perhaps it’s too futuristic…or, maybe not. 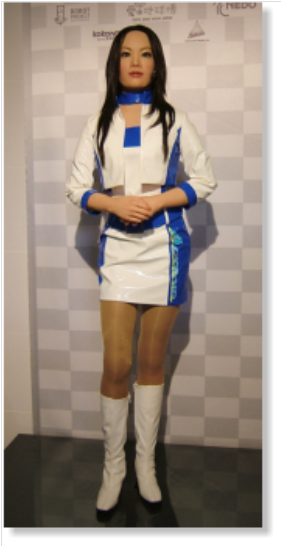 The robots used in robotic parking systems today don’t wear miniskirts or makeup nor do they have a “gender”. Robotic parking system robots come in a variety of configurations and with a variety of functions. Robots used in robotic parking systems may be of an integrated type or a fully or semi-autonomous type. In the integrated type, one or more robots similar to those found in automated storage and retrieval systems (ASRS or AS/RS) are used. Such robots are usually powered from a central power source and may be electromechanical, hydraulic, pneumatic or some combination of all of these. Lifting and transporting systems usually constrain the motions of the robots in an integrated robotic parking system. In an autonomous type of robotic parking system, robots are free to move with minimal or no physical constraints such as tracks, rails, etc. Rechargeable batteries are the usual power source. The robots utilize various types of sensors and communication systems to determine their position, their orientation and the location of features and objects in their environment. A semi-autonomous robot relies upon signals from the robotic parking control system to know which way to move, how far to move and when to pick up or set down a car, etc. On the other hand, the fully autonomous robot might need to be told only to pick up a car at location “X” and park it in location “Y”. Onboard sensors, artificial intelligence and communications permit the robot in the fully autonomous robotic parking system to plot its own path from point to point. In the end, the terms “robotic car parking” and “robotic parking systems” tell us very little about the technology inside an automated parking system. Although, you can be certain you won’t be seeing your robot wearing a miniskirt any time soon.